This Vine Necklace is just the answer for embellishing any outfit. 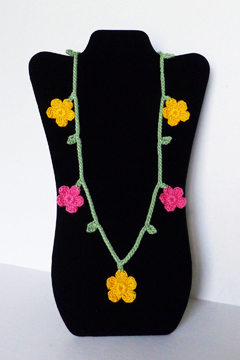 Using size 3 crochet thread, it works up quickly and adds a bit of “whimsy” to your day! 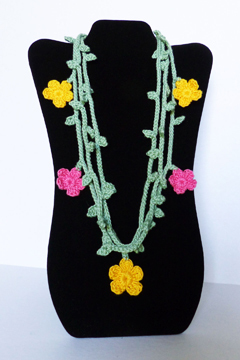 Crochet all 3 chains of only the flower chain with any colors you desire! The pattern includes written instructions, as well as close up photos of each necklace component. Note: Photographed model made with Aunt Lydia’s Fashion Crochet Thread, size 3 in #32 Candy Pink, #606 Goldenrod and #625 Sage.